The land of Domaine des Bormettes hosted some of the first Roman vineyards, but it was the Carthusian monks of the 14th century who developed its signature identity. The Domain’s location certainly is privileged: it is near the sea but set back on the hillsides. The lower lands which extend to the beach were designated for farming use only. This “terroir” is unic. The land holds very stony soil, composed of shale and quartz. This soil easily drains and has a low density of organic matter, making it naturally primed for vineyards and olive groves. Today, the Terroir de La Londe is recognized as the heart of the Côtes de Provence. Not only for its soil, the crystalline and limestone composition which is a trademark of Provence, but also for its climate, dry and temperate, with maritime influences and bay air currents, between the massif des Maures and the Iles d’Or. At the heart of this land, specialists defined three zones of maturity. 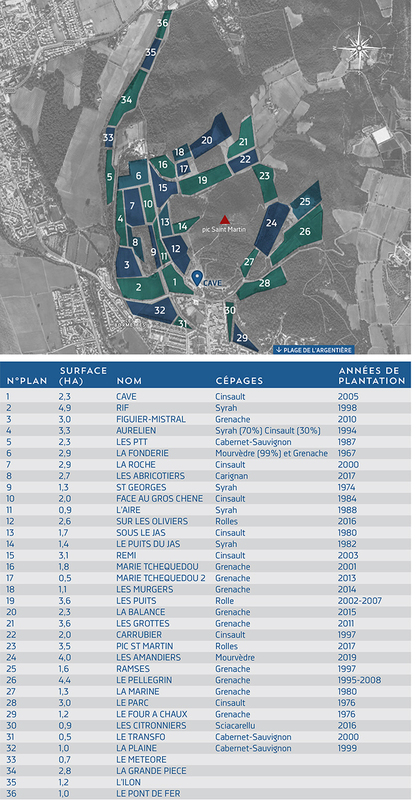 The youngest vineyards, having “les pieds dans l’eau” are refreshed by the Mediterranean sea, the oldest ones on the Maures foothills have due south exposure a few kilometers inland; and the middle land which characterizes the Domaine. Click here to download a jpg format of this map. The Domain has been through many phases of evolution concerning the grape varieties, with a renewal since the 1980s mainly focused on the Cinsault. This hardy grape is able to withstand drought and is perfectly suited to the local soil and the production of pale rosés that are the success of the region. Starting in the early 2000s, the grape variety focus became Grenache. With its deep aromas, it perfectly aligns with the new tendancy of rosés, and its versatility allows it to imbue red wines as well. This grape variety is in tune with the character and the ambition of the Domain.The next step is to work the power of the Rolle, or Vermentino. This white grape has taken marvelously to our soils, strengthening its aroma, for which it is known for in Corsica, while staying very refreshing. This grape is not only used to create exceptional white wines, but can bring an exotic touch to rosé mixtures. Paralleling these major trends, Domain de Bormettes remains dedicated to the preservation of diversity in our grape varieties. Syrah notably enhances our rosés and creates magnificent reds. The Domain intends to reintroduce the Carignan, a local red variety with a controversial reputation, but undeniably adapted to our land. Clairette and Ugni white grape varieties will also be planted to bring their exquisite complexities to our vineyard. The low water reserve of our soil and the long periods of drought frequently observed in the area, have imposed the use of irrigation for a lot of vineyards. Fabrice Faré, owner of “Château des Bormettes”, made a different choice, with a long term vision. Throughout the vineyard restructuring, started in the early 90s and tentatively done in 2025, the land tilled is the object of patient replanting work, adapted to the terroir. The main goal is to take advantage of the rare but heavy rains, penetrating deep in the soil, that will give the roots the opportunity of being nourished deeper and deeper. This long-term work will help resize streams, manage slopes, limit erosion, avoid destruction and help the land on the whole react better to our inherent storms, which can be very devastating in the area. We have also planted grass and barley along our vines to provide ground cover, limit erosion, and act as “green manure.” The grains provide fodder for sheep who frequently eat at the vineyard. The manure will also be used to protect better our ground. Our team prunes our vineyard by hand. We use “Cordon de Royat” pruning, ideal for moderating yields and allowing a perfect amount of grapes per vine. This method also help the mechanization of part of the harvesting, done by night, which is critical for the elaboration of quality rosé wines. Then comes the disbudding work. Seasonal workers come help the permanent team aerate grapes zones and clean the vines’ trunks. It’s at this time that we control for pests. We use pheromone diffusers to confuse butterflies, thus avoiding caterpillars and the use of pesticides. Topping and trimming are done with purpose. Because we choose not to irrigate, the vines are able to feed from the heavy dew, generated by the proximity of the sea. The vines’ leaves are crucial as they cast shadows to protect the grapes from burning and losing their acidity. Our vineyard treatments are varied and adapted to the year’s vintage. In rare circumstances, we remove some grapes from the vine in order to optimize the quality of red wine or to help young vines survive the summer.